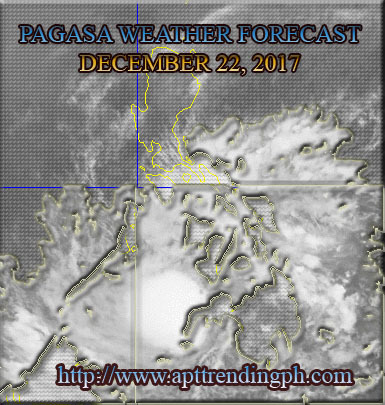 Home PAG-ASA Tropical Depression Vinta Weather PAGASA Daily Weather Forecast issued 4:00 PM, 22 December 2017. PAGASA Daily Weather Forecast issued 4:00 PM, 22 December 2017. SYNOPSIS: At 7:00 PM today, the center of Tropical Depression "VINTA" was estimated based on all available data at In the vicinity of Naga, Zamboanga Sibugay (07.9 °N, 122.7 °E) with Maximum sustained winds of 60 kph near the center and gustiness of up to 90 kph moving West at 20 kph. SYNOPSIS: At 3:00 PM today, the center of Tropical Depression "VINTA" was estimated based on all available data atthe vicinity of Baroy, Lanao del Norte(8.0N, 123.8E) with maximum winds of 60 km/h near the center and gustiness of up to90 km/h. It is forecast to move West at 20 km/h. TD "VINTA" will bring "Rains with gusty winds" in places of Misamis Oriental, Lanao del Norte, Lanao del Sur, Misamis Occidental, Zamboanga del Norte, Zamboanga del Sur, Zamboanga Sibugay, western part of North Cotabato, northern part of Maguindanao, Southern part of Negros Occidental, Siquijor, and southern part of Negros Oriental. TD "VINTA" will also bring "Cloudy skies with scattered rainshowers and thunderstorms" in the Rest of Mindanao and of Visayas. Cloudy skies withscattered rainshowers and thunderstorms will be experienced in Bicol Region and MIMAROPA due to Trough of TD "VINTA"
Northeast Monsoon will bring Cloudy skies with scattered rains in places of Cagayan Valley region, Cordillera Administrative region andthe provinces of Aurora and Quezon. Metro Manila and the rest of Luzon will have Partly cloudy to cloudy skies with isolated rain because also of this Northeast Monsoon.